Zaiput Flow Technologies’ patented liquid‐liquid/liquid‐gas miniature membrane separators enable liquid extraction in ﬂow chemistry‐based processes and provide a solution for typical batch‐based liquid extraction steps (i.e., slow settling time/separation of emulsions, elimination of the need to run batches at half capacity to provide space for subsequent extraction steps). Zaiput’s devices utilize membrane technology to exploit surface tension as a separation driving force. Zaiput’s devices contain an innovative mechanical on‐board pressure control system to provide plug‐and‐play functionality. This modularity allows for use in a variety of conditions and scalability ensures seamless process scale up from bench to production. Zaiput’s separators are rated for high pressure use, allowing in‐line separation in pressurized ﬂow systems. Finally, Zaiput’s devices have broad chemical compatibility, easy maintenance and come at an aﬀordable price. Zaiput Flow Technologies’ patented separator provides continuous separation of an immiscible phase (liquid‐liquid or liquid‐gas) by leveraging diﬀerences in wetting properties of the liquids onto a porous membrane. When a stream composed of two phases (for example: an aqueous liquid and an organic liquid or a gas and a liquid) enters the separator, one phase will have an aﬃnity for the membrane and ﬁll the pores (this is referred to as the “wetting” phase). The other phase will be repelled and will not ﬁll the pores (this is referred to as the “non‐wetting” phase). Once the membrane pores are ﬁlled with the wetting phase, a pressure diﬀerential is applied between the two sides of the membrane. 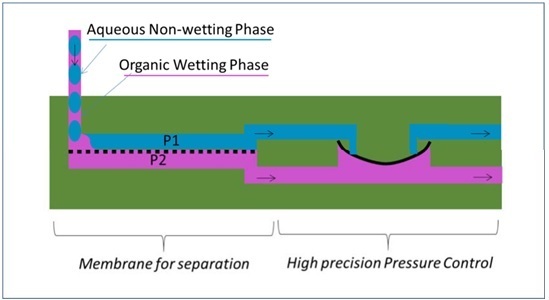 This pressure diﬀerential is ﬁnely adjusted by Zaiput’s patented internal pressure controller to apply just enough pressure to “push” through the wetting phase without forcing the non‐wetting phase through the pores (see figure below). The separator is designed to maintain a constant pressure diﬀerential across the designated ﬂow rates even when conditions are ﬂuctuating. As a result, the separator can be used as a “plug‐and‐play ” modular unit. A key aspect of the technology is that it exploits diﬀerences in wettability and surface forces to accomplish the separation; as a result, the device can separate liquids with the same density and emulsions with continuous operation. Liquid‐liquid extraction is one of the primary puriﬁcation methods providing high selectivity and low energy consumption. Zaiput’s technology provides the ability to perform the extraction in continuous ﬂow with a simple plug‐and‐play device. Zaiput’s separator can be used in conjunction with diﬀerent chemistries, with applications ranging from pharmaceuticals to polymer synthesis. Alternatively, it can be a standalone unit operating in any laboratory or industrial process. In liquid‐liquid reactions, oŌen the reaction stream needs to be quenched by an immiscible phase. Zaiput’s liquid‐liquid separator can be used downstream or in‐line to separate the biphasic reaction. Solvent switching is a common step in multi-step synthesis. In general, it is done manually and in a batchwise process that is slow and tedious. 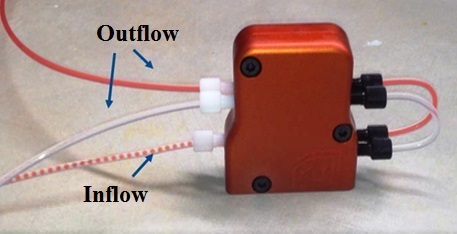 Zaiput’s liquid‐liquid separator can be inserted between two reactions by simply connecting the streams. A biphasic homogeneous‐catalyzed reaction refers to catalysis that takes place at the interface between the two immiscible phases. Despite its high selectivity, it is diﬃcult to operate at a large scale because it requires highly active mixing to keep the two liquids in contact. Even at small‐scale, homogeneous catalysis is rarely used because it poses problems with catalyst recovery via phase separation. Zaiput’s separator oﬀers an easy and ﬂexible way to separate the two phases and recover the catalyst. Complex extraction requiring multi‐stage operation can be quickly accomplished. The scalability of the technology allows seamless processing from the laboratory to the production scale. At the laboratory scale, Zaiput provides an integrated ready to use platform (request the documentation). In‐line analytical tools are typically designed for single phases. Zaiput devices allow separation of a biphasic stream to quickly deploy your in‐line analytical tools. Works with both liquid‐liquid and gas‐liquid streams. Aqueous work‐up for product isolation is tedious and cumbersome, especially in preparative chromatography. In‐line single or multi‐stage extraction with a Zaiput device streamlines operation, simplifying solvent recovery. We would like to thank Dr. Andrea Adamo of Zaiput in Waltham, MA for her support in preparing this blog. If you have a specialty chemical project or small molecule pharmaceutical project and are interested in advancing into continuous or flow chemistry, give us a call today!